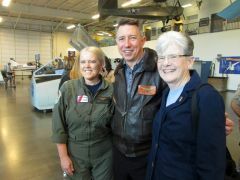 SACRAMENTO, CA (MPG) - Assemblyman Ken Cooley joined the California Legislative Women’s Caucus to recognize extraordinary women from across the state in celebration of Women’s History Month. 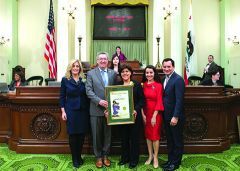 This year, the Assemblyman honored Michelle Callejas of Sacramento. Michelle Callejas has worked in the health and human services field for over 25 years and is currently the Director of Child, Family and Adult Services for Sacramento County. She earned a Bachelor’s Degree in Criminal Justice, a Master’s Degree in Counseling, and is a licensed Marriage and Family Therapist. She began her career at W.E.A.V.E., a local domestic violence agency, providing services for victims of intimate partner abuse and sexual assault. She also provided group counseling for children exposed to domestic violence and delivered court-ordered counseling services for women involved in Child Protective Services trying to reunify with their children. She began working for Sacramento County in 1996, and has served in child welfare, mental health, and the District Attorney’s Victim-Witness program working with family members of homicide victims and victims of hate crimes. 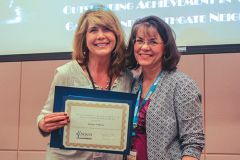 Michelle served as Deputy Director of Child Protective Services for seven years, where she identified opportunities to work with system and community partners to better address the complex needs of children and youth in foster care. 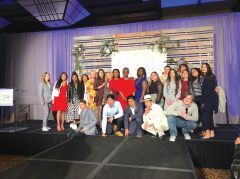 She and several other leaders in Sacramento completed a Multi-System Integration Certificate Program at Georgetown University and have implemented practices to reduce the number of foster children that cross over to the Juvenile Justice system. The team also worked with other community partners to develop a county-wide protocol to identify and serve child victims of commercial sexual exploitation. She is currently co-leading efforts to develop a county-wide prevention plan that focuses on strengthening families and preventing child abuse. “It is truly humbling to receive this award. I consider it a privilege to serve our community and want to acknowledge the dedicated staff in the Department of Child, Family and Adult Services who are serving and supporting children, families and adults each and every day in District 8 and the larger Sacramento area,” said Michelle. 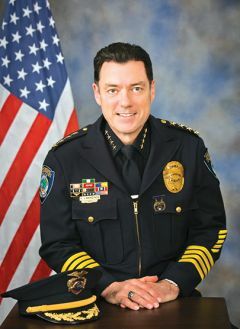 CITRUS HEIGHTS, CA (MPG) - Citrus Heights Police Chief Ronald A. Lawrence will be installed as the 54th President of the California Police Chiefs Association (CPCA) for a one-year term, on March 9, 2019, at its 42nd Annual Training Symposium held at the Hyatt Regency Santa Clara. Chief Lawrence brings extensive experience to the position of President of CPCA, having been in law enforcement for 29 years. He has served as the Chief of the Citrus Heights Police Department since October 31, 2016, having previously served as Chief of the Rocklin Police Department for several years. Prior to becoming a Police Chief, he also served as a Police Captain with the Rocklin Police Department, a Lieutenant with the Palo Alto Police Department, a Sergeant and Police Officer with the West Sacramento Police Department, a Police Officer with the Lincoln Police Department, and a Deputy Sheriff with the Placer County and Sacramento County Sheriff’s Departments. Chief Lawrence was appointed to the CPCA Board of Directors in 2011 and was elected third vice president in 2016. During his eight years on the CPCA Board, he has served on several committees and workgroups, chaired the association’s Finance Committee, as well as the Political Action Committee. “Leading the California Police Chiefs Association this year as President is truly humbling. I join a long history of California police chiefs who have been consistently dedicated to keeping Californians safe, and I am proud of the work we have accomplished over the years. We have proven ourselves trustworthy partners to all who have an interest in public safety; we have championed good policy as well as opposed bad policy, in our focused efforts to protect California communities. There is much to accomplish in the coming year, and we stand ready to continue our legacy of leading professional municipal policing in the state. Our top priorities will be to work collaboratively at addressing issues facing our profession, including homelessness and the mentally ill, strengthening community trust, helping frame the conversation around police use of force, and working to pass legislation to standardize policies and training. I proudly stand shoulder to shoulder with all California police chiefs, who are committed to working with our stakeholders on these priorities and many other issues that impact the safety of California residents,” -Chief Ronald Lawrence. Chief Lawrence is the second police chief to lead the Citrus Heights Police Department, taking the helm from the departments’ inaugural police chief, Christopher Boyd, who is the current City Manager. Boyd served as CPCA’s 49th President in 2014, prior to taking the City Manager position and hiring Chief Lawrence to lead Citrus Heights Police Department into the future. Boyd will administer the Oath of Office for Chief Lawrence’s CPCA inauguration on March 9, 2019. During Chief Lawrence’s tenure at Citrus Heights, the crime rate has lowered, and addressing homelessness has been a top focus. CITRUS HEIGHTS, CA (MPG) - The City of Citrus Heights applied for the Highway Safety Improvement Program (HSIP) grant and was awarded $486,000 of grant funding. 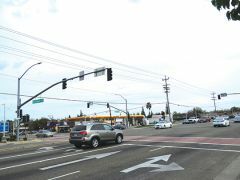 The funds will be used for the Signalized Intersection Safety Improvement Project, which includes upgrades to traffic signals and pedestrian signals, and improvements to increase safety at certain intersections. The project will upgrade many traffic light signals from 8 inches to 12 inches. The larger traffic signals will be more visible to approaching drivers, increasing the time drivers have to react to signal changes and enhancing their ability to react to roadway conditions. Pedestrian signals will be upgraded to the countdown model, which displays the time remaining for the pedestrian to finish crossing the street. The countdown function reduces the number of pedestrians in the roadway when the signal light changes because pedestrians have more information about when it is safe to cross. Many pedestrian signals in the city already use the countdown model, but 11 still need to be upgraded. The east side of Sunrise Blvd. at Macy Plaza Dr. (adjacent to the Sunrise Mall) currently has no push buttons or pedestrian signals to inform pedestrians when to safely cross the roadway. There is not much room for pedestrians to stand while waiting at the light, and the crosswalks are very narrow. The planned improvements for this intersection include adding pedestrian push buttons and countdown pedestrian signals, installing ADA (Americans with Disabilities Act) accessible curb ramps, and widening the crosswalk. Another major safety improvement is the installation of pedestrian safety fences within the existing raised medians at the Greenback Ln. and Auburn Blvd. intersection. This intersection is heavily trafficked, with 73,000 vehicles crossing it each day. It has the most collisions as well as the most pedestrian-involved collisions in the entire city. Helzerman appreciates that the City is “doing all they can do” to increase safety for everyone in the city. The City asked residents and commuters to provide input on their preferred style out of four pedestrian fencing options: plant-climbing fence, scalloped fence, straight-topped fence, and unfinished hog wire fence. The fence options are each approximately 4 feet tall to create a barrier discouraging pedestrians from climbing or jumping over. The designs allow for visibility so drivers can easily see over and around the fences. The City plans to install the fencing around the existing median landscaping, and it would be installed in a series of panels, so it will be easy to replace a section if it is damaged. The options were presented through various public outreach measures, at an Open House last month, and through an online survey that was available throughout the month of February. After reviewing all the feedback received on fence preferences, the options were presented to the City Council on March 14. Leslie Blomquist, senior civil/traffic engineer, told the Council that the City received a total of 501 responses, and the plant-climbing fence received the highest average of positive votes. The plant-climbing fence has curved panels with space for climbing plants and vines to grow up and within the panels. This option would beautify the intersection, but would also require additional planting costs and ongoing costs for maintenance and water use. Since that intersection is a major entrance to the city, the Council agreed that it would be worth the extra money to add some visual interest with the plant-climbing fence. Mayor Jeannie Bruins suggested that the plants installed along the fence should be drought tolerant in order to offset the water and maintenance costs as much as possible. Vice Mayor Jeff Slowey commended City staff on their public outreach efforts, noting that it is rare to receive so many public responses to a City project. The Signalized Intersection Safety Improvement Project is currently in the final design phase, and construction is expected to start in late summer of 2019. 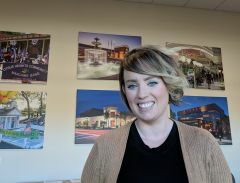 CITRUS HEIGHTS, CA (MPG) - In January, the City of Citrus Heights welcomed Meghan Huber as the new economic development manager. Prior to taking on this role in Citrus Heights, Huber worked as an economic development analyst for the City of Rancho Cordova for three years. Huber has a background in hospitality and sales marketing with Marriott and Hilton hotels. Retaining and supporting existing businesses is an important part of Huber’s job, so she has introduced herself to local business groups like the Citrus Heights Chamber of Commerce, Sunrise MarketPlace, Auburn Blvd. Business Association, and Antelope Crossing Business Association. In order to attract new businesses to the area, Huber spends time researching available real estate in the city so she can match businesses with appropriate locations to suit their needs. “The most important part is to ask the right questions to get to know a business, their product or service, operations, [and] customer type so I can point them in the right direction,” said Huber. One “compelling story” Huber is using in her marketing materials is that the “intersection of Sunrise and Greenback is the third-highest traffic count area in Sacramento County. Recognizing how vital small businesses are to the local economy, Huber said, “We build out tools and resources to support our current small businesses and attract new ones.” As an example, Huber cited the Auburn Blvd. Business Association, which has 229 businesses averaging fewer than eight employees per business. “To support this important corridor, the City of Citrus Heights created the Activate Auburn grant program that provides consulting for ideas on how to enhance the exterior of a property and funding to make those improvements,” said Huber. Huber works to “amplify the voice of the City of Citrus Heights” and partner with property owners, brokers, and businesses – all of whom contribute to and are part of the local economy.